So, you think you're a nordic skiing fan. I mean, you read FasterSkier, maybe even Team Today, so you're pretty much an expert, right? You know Tobias Angerer won the World Cup. 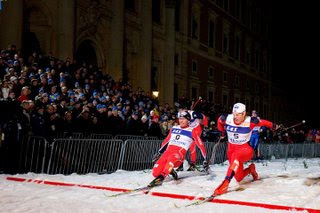 You know Petter Northug isn't going to lose a relay finish for the next 20 years. You know that Andy Newell is the first American to lead the FIS sprint points ranking in... forever. 1) Who scored more World Cup points last year, Torin Koos or Toby Fredrickson? 2) Tobias Angerer scored (a) 30% (b) 60% (c) 90% more points than 2nd place overall. I skipped out on Canton to see a friend from school who lives in Bennington and do the Wicked Creepy Cross race instead. The drive was long (nearly 3 hours) but totally worth it for the epic course. 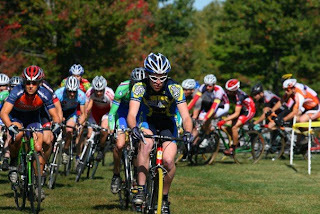 Danielson on Saturday -- yes, that was a fun course, but it wasn't even remotely UCI legal. Fields of 40 would have been a nightmare. Wicked Creepy, on the other hand -- flippin' perfect. A compact six minute lap laid out across a windswept hillside made for one of the best cross courses I've had the pleasure of riding -- power on the way up, technique on the way down, pavement, dirt, off-camber galore, even a wet sandpit. An amazing job for a first-time promoter, and it all held up to the 30 mph gusts throughout the day. After two weeks without cross I was so, so ready to get back on my bike. A whole lot of rain overnight and in the morning had me psyched for some technical messiness. Sure enough, the course was kind of slick and totally jungle cross -- a nice payback for me after the Autobahn at Gloucester. Unfortunately, with Canton on Sunday and rain covering the doppler, the cross scene pussied out big time. We ended up with a grand total of 10 3/4 men on the start line, which might have been the biggest field of the day. Too bad, since it was a fun course and not pouring rain. You know who did show up, though? The BMen of the Blogosphere (look for our calendar next spring!). So, I got to throw down against a bunch of e-quaintances without pack fodder in the way... good times. What's the deal with NEBRA? I must preface this entry with the disclaimer that I am a mountain biker, and thus my "governing body" is NORBA for most of the year. As cyclocross seems to be derived from road cycling (at least around here), I am generally unfamiliar with the "culture" of the scene I invade for a few months each fall. So I may be miles out of line here. 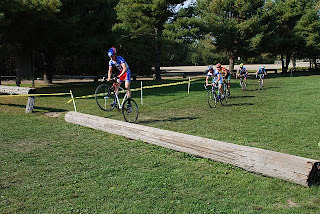 There seems to be a governing body for New England cyclocross, known as NEBRA. I know this because occasionally there are races labeled "part of the NEBRA series" and somewhere on my USA Cycling page it says my regional affiliation is with NEBRA. So let's investigate this "NEBRA cyclocross" thing. Their website lists a cross schedule with 13 events on it. So far we've had 4 NEBRA races this season (who knew!) - Sucker Brook, Downeast, and Gloucester x2. This weekend is a 5th Nebra race, Canton, which goes so far as to list themselves as a NEBRA race on bikereg. I have so much time when I'm too sick to ride! It's kind of cool in a way. I put together some footage from the last few weeks. It's no todcast, but hey, what is? Gewilli's recent post about starting got me thinking, why is clipping in such a hard thing for so many people? I went to a park to see if I could stomp some starts and lo and behold, I couldn't. I had, at best, a 20% success rate. Dejected, I turned to ride home and absentmindedly clipped in -- flawlessly. Since that moment I don't think I missed a single clip-in. I tried a couple times on the way to work each day and nailed it every time. In lieu of race reports, I will share my secrets with you! Here's the trick -- slap your foot on the pedal once on the upstroke and then clip in on the downstroke. The first contact tells you where the pedal is, and if you have a good feel for mtb pedals (i.e. you didn't just start riding them this year) you can tell exactly how much you missed by. Make the slight adjustment you need as the pedal comes over the top, clip in on the way down, and you're gone. Works. Every. Time. This weekend was supposed to involve racing at Southington and this week was supposed to involve lots of training. Instead, both of those involved/will involve lots of time being sick. I guess I'm just going to take the whole week off and see if I can race this Saturday while unleashing a torrent of snot all over the field. Certain individuals have been heckling me for having top-mount brake levers for quite some time now, and have recently taken this heckling all over the internets. I'm sick of this being a point of discussion, so I will present what I call the "top mount equation." It's a useful tool for determining whether or not you, dear reader, should be riding cross with top mount levers. So, the value TM is the sum of 6 variables, and obviously stands for your Top Mount needs. The catch here is that those variables are different for everyone -- L for Colin is different than L for Anonymous-blog-reader. That's what makes this discussion so annoying, but also what lets you play along at home! Huzzah. C - City Riding. I know, the first variable has nothing to do with cross. How weak is that? Fresh off a day of getting beat up by roadies, I went back to Gloucester with high hopes. I figured that whatever changes they made to the course would be in my favor -- it's not like they could make it less technical, right? So I was thinking that with a more intelligent fueling strategy and a harder course I could make the top 30. Well, I neglected to account for the possibility that they might not change the course at all. 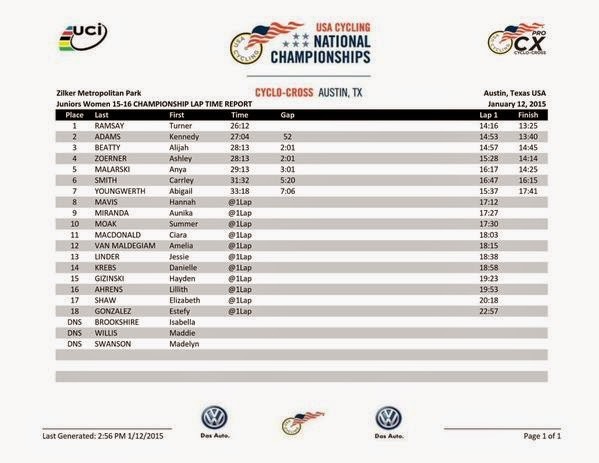 I was seriously bumming when I discovered the same grass crit as the day before, but Linnea tricked me by pretending that she was even more bummed and was thinking about not racing (ah, to be able to reg day-of....). 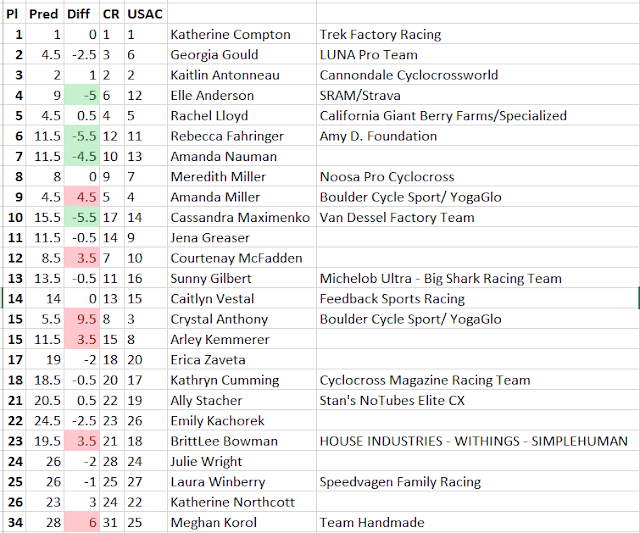 And then I was like, "Screw that, it's Gloucester, you gotta race," and I realized that even a grass crit is still a cross race, which means it's awesome. I hadn't done anything to try to peak for Gloucester, so combining that with the super-roadie-friendly course, I was on the start line in just-happy-to-be-here mode, surrounded by 123 insane B men and Lyne Bessette. I had a start that was decent, riding Tal Ingram's wheel for the first half and then sprinting up the left side to make a ton of places before getting squeezed down. But as we hit the path along the seawall I could already tell that this wasn't going to be a record setting day. Before the runup there was a crash, and guess who's down! Lyne Bessette! This is it, this is my big chance to beat my Canadian overlord, my brain said to my legs. But not 2 minutes later she tore past me like a bat out of hell, and I had no chance to raise the pace to her level. She was gone, on her way to a ridiculous 7th place in 2/3 Men despite crashing on the first lap. I love the road bike review cx forum. I hate the road bike review cx forum. Why? The equipment obsession. If you read this forum daily (which I regret to admit I do), you start to think that all there is to cross is bikes. You start to think that maybe your bike isn't adequate, you start to think that all Cat 4's race on 404's with tubulars, you start to think that if you don't take out your water bottle cage screws and replace them with scotch tape (you could save 15g that way!) that you'll never compete. Of course, this is all hogwash. Anyone will tell you that cross is won with legs, not equipment. Everyone posting knows this, there's no harm it talking about bike parts all day, right? Another Sunday, another chance to suffer at the hands of those who didn't race Saturday. 6:30 AM found Justin and me back on the road with egg sandwiches heading up to New Gloucester. Shortly after arrival Justin showed how quickly having grease and coffee for breakfast can make you by winning the C race, so I had a tough act to follow. The course was hard but fun, two awesome off-camber sections, a long bumpy soul-sucking climb, and a big time run up through the woods. My legs were absolutely wasted but there was enough technical stuff that I could dish out a little pain as well to the roadies. 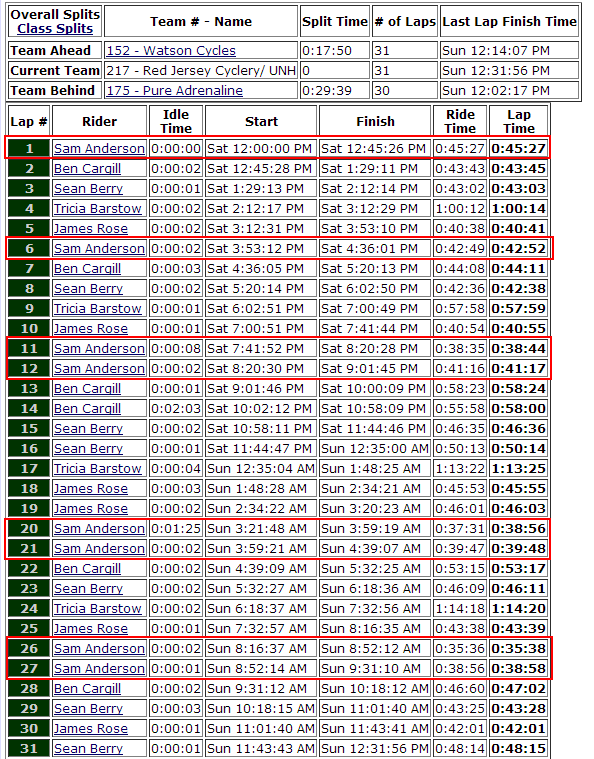 Oh man, this two-races-per-weekend business makes keeping up with race reports damned hard. It will be interesting to see if I can keep racing and blogging twice per weekend, lucky for me cross is so awesome so there's always good stuff to write about. 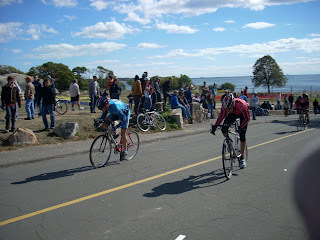 Casco Bay cross was Saturday on a pretty interesting course -- I would describe it as mountain-bikish, not because it was rooty and rocky but because it had a very distinct climbing phase and descending phase each lap. The descent was a legitimate 20 seconds or more of recovery, pretty rare in a cross race. It also had a tough but rideable sandy beach section and a "big log" in addition to the barriers. Each lap finished with a punishing dirt road climb that was made even worse by the 80 degree temps. 1) A wanna-be fixed gear freestyler is trying to trackstand at the light in front of me, but he doesn't know how to do it so he's twisting his bars back and forth and rolling forward super-slowly. Then, the light turns green, and he responds by falling over because he can't get out of his toe clip. I laughed at him as he lay on the ground, but it was a nice kind of laugh. He knew he deserved it. 2) Not even a mile later, the guy in front of me almost gets cleaned out by the car-turning-left-through-stopped-traffic move. He shouts something expressing his surprise, fear, and disgust as he slams on the brakes. The car that almost hit him stops on its way down the side street, the driver leans out the window and yells, "I DIDN'T SEE YOU!" The guy responds with "THAT'S OK!!" and rides off happily. And they say bikes and cars can't get along. As of Sunday, my first full MTB season since I was a Junior Sport racer back in High School is over. I ended it with the biggest (in both participants and distance) race I've ever done -- the one, the only, the Vermont 50. The Vermont 50 is such a big deal that, in 2007, the 850 MTB slots sold out in under 30 minutes of registration opening, IN MAY. It was such a big deal, you needed a photo ID to pick up your number so that you couldn't sell your spot to the highest bidder. And then you needed to check in again, in the morning, at 5:30 in the dark, for some added level of security I didn't quite grasp. Anyway, this thing is hard to get into, but here I was lined up at 6:20 AM, because I mortgaged an evening back in May to sit at the computer. Since I don't want this to be a really negative report, I'll start with everything that wasn't super-awesome about this race.